cupies, the north half of section twenty, township twenty-five, range two, and erected all of the buildings on the place. No finer farm property is to be found in this part of Nebraska. Mr. Lederer was married November 27, 1873, to Miss Mary Brubaker, of Whiteside county, Illinois, whose parents, Daniel and Annie (Meyers) Brubaker, came from Franklin county, Pennsylvania. Mr. and Mrs. Lederer are the parents of eight children, named as follows: Louis Henry, Charles Marion, Noah Webster, John Martin, Cleo, George W., Walter Scott, and Ruth Mary. Some of the children are married, and have presented the old people eight grandchildren. Mr. Lederer votes the republican ticket, and was reared in the Lutheran faith. Christian Nelsen, a well-to-do agriculturalist and business man of Howard county and owner of a valuable estate in Loup Fork precinct, is a son of Nels and Mariane Envoldsen, whose life histories are recorded in this volume on another page. He was born in Denmark in 1870, and was about two years of age when his parents emigrated to America. Mr. Nelsen grew up in Howard county, Nebraska, as a mere boy taking a man's place in helping his father carry on the home farm. In 1893 he struck out on his own hook, purchasing a tract of land containing eighty acres, situated on section twenty-four, township thirteen, range twelve, which he put in good shape and carried on for three years. He erected substantial buildings and engaged in mixed farming and stock raising, and then sold out at a profit. About 1897 he moved to Boelus and engaged in the livery business. He put forth every effort in building up a trade, had first class rigs, was ever trying to please the public and give them the best service possible to be had, and ran the barn successfully for about three years, at which time he was appointed manager of the T. B. Hord Grain and Elevator Company in Boelus. In this capacity owing to his energy and good business ability he has gained the entire confidence of his employers and continues in the work at the present time, proving a most efficient and reliable man for the place, whose services are greatly appreciated by the company. Mr. Nelsen was married in August, 1905, to Mary Rasmussen, of Howard county. Mrs. Nelsen had been a popular teacher in the public schools of Nebraska for six years prior to her marriage, and is an accomplished and charming young woman. They have one child, Christian Adelbert, who is a bright and promising youngster, the pride of his parents' hearts. Our subject is a young man of promise, and in the various enterprises in which he has engaged, has met with merited success. He is owner of a handsome residence property in Boelus, also owns a fine quarter section of land in Sherman county. Edward Fagen is one of the few original homesteaders of Sherman county who still resides on their original homestead farms. He was born in Dubuque, Iowa, April 3, 1852, fifth of the eight children born to Edward and Mary (O'Rourke) Fagen, who were parents of five sons and three daughters. When Edward Fagen was six months old his parents located on a farm where he was reared and remained until his twenty-fourth year, receiving his education in the local schools. He then moved to Harrison county, in western Iowa, rented a farm and engaged in farming on his own account. He may be said to be a self-made man, as at the time he left home he had but fifty dollars in cash, but was possessed of energy and ambition and also a determination to improve his condition. On February 2, 1880, Mr. Fagen was united in marriage with Miss Mary McDowell, the eldest of the eight children of Barney and Mary (Hughes) McDowell, then living in Harrison county, Iowa. In the fall of 1883 Mr. Fagen made a trip from Harrison county, Iowa, to Sherman county, Nebraska, where he took up his present homestead on section seven, township sixteen, range sixteen, then returned to his home in Iowa. The following spring he made the trip to his new home with teams and wagons, taking his household goods and driving cattle to the homestead, the trip lasting about ten days. His wife and their two children, Agnes and Minnie, came by railroad to Grand Island, Nebraska, and thence by team to the new farm. In that day Grand Island was the trading point for a large territory in the surrounding country and was a busy, thriving town. The Fagens were among the early settlers of Sherman county and passed through years of privation and struggle against pioneer hardships and discouragements. Mr. Fagen became one of the most successful farmers and stockmen of his part of the state and now owns the east half of section seven, where he has a comfortable home and a well equipped farm. In a quiet, unassuming way he has assisted in the advancement and progress of central Nebraska and has many close friends there. His is a representative family and they have at heart the best interests of the community. Six children have been born to Mr. Fagen and wife, of whom five now survive, namely: Agnes, wife of Alfred Anderson, of Fremont, Nebraska, has one child; Minnie, wife of Theodore Guyon, of Fremont, also has one child; Vincent, at home; Katie married Thomas Murrey, and they live in Custer county; Elizabeth, deceased; Edward, at home. Mr. Fagen is independent in politics, voting for the man irrespective of party. With his family he is a member of the Catholic church. When the blizzard of January 12, 1888, struck, Mr. Fagen was riding to Arcadia with a neighbor. As soon as the storm abated he started back on foot, reaching home about daylight, braving the bitter cold to be assured that his family was not suffering. Mrs. Fagen, when the storm came on, turned the cattle out of the pen coralls [sic] that they might find shelter behind the stacks and brought in corn enough to burn and keep them warm through the night. Among those who have contributed largely to the prosperity of Madison county, Nebraska, and whose patient industry and well directed energy have brought individual competence, may be mentioned Jacob Muller, whose fine farm lies in section six, township twenty-three, range three, where he has built up a pleasant, comfortable home, and enjoys the respect and esteem of a large circle of friends. Mr. Muller is a native of Hamburg, Germany, where he was born in October, 1856, a son of Henry and Lizzie Muller, both natives of the German Empire, who died when our subject was but a small boy. Mr. Muller grew to his manhood days in his native land, receiving the usual schooling, and working on farms and after attaining the proper age was drafted into the army, serving three years as a soldier of the German Empire. In 1887, Mr. Muller left his fatherland for America, the new world of which he had heard so much; he embarked on the steamship "Hapsburg," sailing from Bremen, and landed in New York after a voyage of twelve days. After reaching the United States, he immediately started for the west, locating in Saline county, Missouri, which was his home for five years. In 1892, Mr. Muller came to Madison county, Nebraska, where he bought the Joe Hurd homestead; on this land he first built a shanty, living in this a few years, when a fine new residence replaced the original dwelling. Although not as old a settler in point of time as some, of the inhabitants of this region, Mr. Muller has proven himself a worthy and progressive citizen in his eighteen years or more of residence here. He has made rapid improvements on his property and now owns a good farm and home where he and his family enjoy the respect and esteem of all who know them, and in their home are surrounded by a large circle of friends and acquaintances. Mr. Muller was united in marriage to Miss Anna Buck, in June, 1888; Miss Buck was a native of Hanover Province, Germany, and a daughter of John and Margurete Buck, also natives of Hanover Province. Mr. and Mrs. Muller are the parents of five children ,whose names are as follows: Maggie, Lizzie, Annie, Martha, and Elmer. Samuel M. Luce is a citizen who is much interested in everything pertaining to the welfare and progress of Custer county and Nebraska, and has been a resident of the state about thirty years. He is a native of Maine, born near Bangor, March 25, 1850, sixth born of the eight children of William and Hulda (Rogers) Luce, the father a native of Maine and the mother of Massachusetts. Both parents died in Iowa, the father about 1871 and the mother in 1870. Four of the sons served in the civil war, but in different regiments, all from Illinois: William S., in the Ninth Cavalry, Alonzo in the Nineteenth Infantry, Richard in the Ninety-third Infantry and Isaac in the One Hundred and Twelfth Infantry. The children now surviving are: two sons in Clarke county, Iowa; one son in Iola, Kansas; one daughter in Oklahoma, and Samuel M., of this article. In 1854, when about four years of age, Mr. Luce accompanied his parents to Grand Prairie. Stark county, Illinois, and there he received most of his education. In 1866 the family moved to Clarke county, Iowa, where Samuel completed his education and then engaged in farming on his own account. He was married near Leslie, Clarke county, February 28, 1872, at the home of her parents, to Miss Mary V. Perry, a native of Illinois. Her father, Zachariah Perry, was a native of Kentucky, moved to Illinois before his marriage, and in 1882 took a homestead in Custer county, where he died in 1893. The mother, whose maiden name was Sarah Keedy, was born in Illinois and died in Custer county in 1892. Mrs. Luce has a brother, Elijah, living two miles east of Merna, Custer county; her brother, Robert,, lives in Broken Bow, where he has it plumbing business, and another brother, Charles Rufus lives near the Luce homestead, three miles southwest of Merna. part of it being his original homestead. He is much interested in local affairs and was instrumental in organizing school district number sixteen, helping to erect the little sod house. He served many years on the school board and was road supervisor eight years. He is well and favorably known in the county, in many circles, and identified with the movements for the development and upbuilding of the region. He is affiliated with the Modern Woodmen, the Modern Brotherhood, Odd Fellows and Rebekahs, being active in all these orders. In January, 1906, he retired from farm work, erecting a handsome residence in Merna, the present home. For sixteen years he conducted a threshing machine, but in 1887 his left hand was caught in the machinery and taken off. Mr. and Mrs. Luce have had seven children: Sarah F., wife of Benjamin Browning, of Merna, has two sons; Elijah L., married and living twelve miles west of Merna, has two sons; Nancy, wife of Del Jones, of Merna, has five sons; LeRoy L., married and living in Merna, has two children; John W., married and living at Ulysses, Nebraska; Charles W., whose wife died in May, 1909, has two children; Bessie, married Orvil Burton and they live on her father's original homestead. In compiling it list of the citizens of Wayne county, Nebraska, who have become identified with the development of the agricultural and live stock interests of that region, a place must be accorded the name of the above mentioned gentleman, who is the owner of a valuable estate located in section sixteen, township twenty-seven, range one. He has there a comfortable home, and has gathered about him the comforts and many of the luxuries of life, and is reaping the reward of his years of hard work. Mr. Sellon was born in 1864, in the state of Iowa. His parents, William and Theresa Sellon, are of English descent, the family having come to this country at a very early date. C. O. Sellon spent his childhood and early years in his native state, which was then regarded as being on the frontier. In 1884, Mr. Sellon came to Wayne county and worked on various farms until 1891, when he purchased his present farm, and this estate has been his home ever since. The subscriber has met some of the usual reverses encountered by the settlers, but he is a man of great energy and has prospered through his persistent efforts. Since his possession, he has added many improvements to the estate which have greatly enhanced its value, the place being wild prairie at the time of purchase. For many years, he has given considerable time and attention to cattle, hogs, and sheep, and has met with great success. Mr. Sellon was married, in 1888, to Miss Maggie McNeill, of Cedar county, but born in eastern Iowa, and ten children have been born to them: Harry, Roy, Vernie, Ray, Gail, Mark, Ora, Arthur, May and Elsie. Mr. Sellon has always taken an active interest in till public affairs and has materially aided the development and upbuilding of the communtiy [sic]. In reviewing the life history of this gentle man, we find him to be one of the oldest men of his locality, as well as among the very earliest pioneers of middle Nebraska. Mr. Patterson has seen all the wonderful changes incident to the development and progress of a country blessed with more than the usual amount of natural resources, and in this advancement he has himself been no small factor. Mr. Patterson was born in Tompkins county, New York state on January 4, 1834, and grew to the age of six years in that vicinity, then his parents moved to Wisconsin, where he received his education and at the age of twenty started out for himself, doing government surveying in Minnesota. In 1858 he went to Colorado in search of gold, and spent two years in the west, then returned to Minnesota and arrived home just in time to cast his first vote for Abraham Lincoln for president. At the first call for volunteers by his country, he enlisted and had the honor to be the first man to put his name on the roll as ready for service in the army. He remained with his company for about eighteen months, then received an honorable discharge and went to Wisconsin where he began farming and was married there on February 23, 1865, to Miss Cynthia Smith, of that state. In 1871 he came into Nebraska, settling on a homestead in Boone county and succeeded in building up a good farm, passing through all the pioneer experiences of those days, finally retiring from agricultural pursuits in the fall of 1879, at that time locating in Genoa. He remained there for eight years. His next location was in Central City, where he served as county surveyor and city engineer for four years, then went to Boone county and was county surveyor there for a number of years. In 1900 he removed with his family to Genoa, and has made that his home since that time. The Patterson family are widely and favorably known throughout Nance county as being among the prominent pioneers of the region. Mr. Patterson is well-to-do, having accumulated a valuable property by dint of thrift and good business ability, and he also takes an active interest in the commercial and political life of his county and state. Joseph J. Walker is a gentleman of active public spirit and sterling character, who has taken all active part in the upbuilding of the region where he chose his home many years ago. For many years he has been associated with the agricultural and other best interests of Boyd county, Nebraska, where he now resides on section thirty-one, township thirty-five, range twelve, highly respected and esteemed by all with whom he has had to do. Mr. Walker was born in 1858, in Grant county, Wisconsin, a son of Jonathan and Louisa (Eldridge) Walker, who were natives of New York state. Our subject's father served in the civil war, enlisting in a Wisconsin volunteer infantry regiment, and saw duty all through the war. He served under General Sherman and was with him on the memorable march to the sea. After the war, Jonathan Walker continued to reside in Grant county, Wisconsin, and lives there at the present time. Our subject's mother died there in 1876. In 1884, Joseph J. Walker and family moved from Wisconsin to Moody county, South Dakota, where they remained three years, then going to Sioux county, Iowa, living there six years. In 1890, Mr. Walker, our subject, and family, drove from Sioux county, Iowa, to Boyd county, Nebraska, where he took up a homestead five miles west and two miles north of Butte, which he improved and on which he built a frame house. He remained here until 1904. He then sold, and bought the Sid Smith homestead, and now owns two hundred and forty acres of good land, and also has ten acres of natural forest trees along the creek. September 2, 1880, Mr. Walker was united in marriage to Miss Rosa Gratz, and Mr. and Mrs. Walker are the parents of nine children, whose names are as follows: William J., Anna E., Stella E., Rosa E., Mabel L., Clayton J., Howard C., Arlie 0. and Drusilla T.
Mr. Walker has had his experiences and hardships of Nebraska frontier life, but these events have passed into history, and he now enjoys the prosperity that has come to the faithful who have stuck through thick and thin. Frederick Rabeler, senior, was born in Germany, June 8, 1841. He came to America in August, 1882, first locating in Platte county, Nebraska, where he remained about six months, and from there moving to Stanton county. Mr. Rabeler was the third child in the family of Frederick and Anna Rabeler, who had one son and three daughters. Mr. Rabeler was married in Germany to Miss Margaret Putensen, May 1, 1869, and at the time of emigrating to America, there were in the family himself, wife and six children. They now have seven children, whose names are as follows: Frederick H., married and living in Leigh, Nebraska, who is mentioned at length in this biographical writing; Alwine, married to Carl Mullenhoff, they having five children and residing in Colfax county; Marie, wife of Ed. Wurdeman, has three children, and lives in Leigh, Nebraska; Henry, married and living in Stanton county on the home farm; Freida, wife of Oliver Oleson, lives in Platte county, Nebraska, they having five children; Paulina, who was born in Stanton county, Nebraska, is the wife of Clarence Oleson, has two children and lives in Platte county, and Alex, also born in Stanton county, where he is residing at the present time. Mr. Rabeler upon coming to Nebraska purchased six hundred and forty acres of land in Stanton county, where he now owns sixteen hundred acres, and one hundred and sixty acres in Platte county. He has been all active and progressive man of affairs and is one of the prominent farmers and stockmen of this portion of Nebraska. He has passed through the adverse years of this portion of Nebraska, and assisted in building up this section of the state. He and his family are widely and favorably known, and have had much to do with the affairs of their community. Mr. Rabeler now resides in Leigh, Nebraska, where he came to live in 1900, and is vice president of the First National bank of that place. Frederick P. H. Rabeler, junior, was born in Germany, December 28, 1872, coming to America with his father and family in August of 1882, when the family located in Stanton county, Nebraska. Here our subject grew up on the farm, and in connection with his schooling in Germany, received the usual school advantages. In 1901, Mr. Rabeler went out in life for himself, becoming connected with the Farmers and Merchants Bank of Leigh, Nebraska, in June of 1903. This bank has been merged into the First National Bank with a capital of fifty thousand dollars. The Farmer's and Merchant's Bank was first organized in 1886. In May of 1910, the Farmers' & Merchants' Bank of Leigh, and the Maple Valley State Bank of Leigh, Nebraska, were consolidated into the First National Bank, with the following officers: Thomas Mortimer, president; J. H. Wurderman, vice president; F. Rabeler, senior, second vice president; F. Rabeler, junior, cashier; R. J. McNary, assistant cashier, and J. E. Spofford, assistant cashier. Mr. Rabeler, junior, was married to Miss Florence Bowers, June 3, 1908, in Omaha, Nebraska. Mrs. Rabeler is a native of Colfax county, and the Bowers family is one of the first pioneer families of Colfax county. Mr. and Mrs. Rabeler have two children, Florence Margaret and an infant. Mr. Rabeler is one of the prominent young business men of Leigh, Nebraska, where he is prominent in business and social circles. The gentleman mentioned above is one of the sturdy sons of Sweden, who came to the new world with a brave heart to carve out a name for himself and establish a home in the west, and well has he succeeded in his determination, now being proprietor of a good ranch, and has also become one of the prominent citizens of his locality. He resides on section twenty-four, township twenty-five, range eight, Clearwater township, Antelope county, where he owns a good farm of five hundred and twenty acres, making a fine home. Mr. Johnson is a native of Skone, Sweden, born April 8, 1861, and is the son of Olaf and Helen (Pierson) Johnson; both natives of Sweden; the father is still living at Elgin, and enjoys the ripe age of seventy-six years. In 1880 our subject and his father came to America, sailing on the White Star Line steamship from Liverpool, landing in New York City, August 23, 1880. After reaching New York they started at once for the west. Mr. Johnson, out, subject, went to Kansas City to procure work, he being then full grown to manhood, and able to care for himself. He worked as a laborer in Kansas City for eight years, saving enough money to enable him to come to Antelope county, Nebraska, and start farming. In 1900, he bought it farm of three hundred and sixty acres, and here he has built up a beautiful home for his family, he having married while residing in Kansas City. Mr. Johnson was married April 5, 1884, to Miss Elise Akstrom, a native of Skone, Sweden, and a daughter of John and Johannah (Pierson) Akstrom. Mr. and Mrs. Johnson are the parents of six children, whose names are as follows: Roy; Almer; Oscar; Esther; Mabel; and Mildred. Mr. and Mrs. Johnson and family are held in high regard in their community, and Mr. Johnson is prominently known as a most estimable and upright citizen. Mack C. Warrington is numbered among the pioneers of Custer county, Nebraska, and has always been ready to do his part to advance the general welfare and prosperity. He was born at Guthrie Center, Iowa, October 29, 1864, a son of William and Julia (Cooper) Warrington, and fourth of their six children. The father, a native of Yorkshire, England, came to America about 1852 and located at Hartford, Connecticut. He died at Guthrie Center, July 31, 1907. The, mother, a native of Tipperary, Ireland, came to America in 1848 and died in Guthrie Center in 1901. They were pioneers of Iowa and erected the first house in the town where both died. Of their children, one son, Bert, lives in Iowa; a daughter, Mrs. Ann Holster, lives in Mason City, Nebraska; another daughter, Mrs. T. J. Campbell, lives in Colorado; Mack C. is given further mention below, and two are deceased. Mack C. Warrington reached manhood in his native state, receiving his elementary education in local schools. Later he attended Cornell college, at Mt. Vernon, Iowa, and after leaving school he learned the printers' trade. In August, 1886, he located at Mason City, Nebraska, becoming a member of the staff of the first paper published there, the Mason City Transcript. He became proprietor of this periodical in 1887, and has since edited it under the original name. It is an organ of the democratic party and widely read throughout Custer county. Mr. Warrington is a wide-awake, enterprising man, and regarded as an upright, useful citizen. He helped to organize the village and the school district; served eleven years on the school board, some time as chairman of the town board, and during Cleveland's administration served as postmaster. He is now serving as justice of the peace. He is well known in fraternal circles as a charter member of the local Masonic order and as one of the organizers, and also belongs to the local camp of Modern Woodmen of America. Mr. Warrington was married at Broken Bow, October 4, 1893, to Miss Mena Mengel, who was born in Springfield, Illinois, where her childhood was spent. They are well known socially and have a wide circle of friends. Mr. Warrington erected their present comfortable home in 1898. It has been said with truth, that "America is the melting pot of the nations," and the same can be said of almost any state in the Union. It applies to Nebraska, most certainly, for although all of the early settlers are Americans now, yet in many instances, they were born under other colors than the stars and stripes, and even if American born themselves, one generation back, or at the most, two, will almost invariably take us across the water to the Old World. Alexander Matheson, one of the most prominent retired farmers of Stanton county, was born in Walworth county, Wisconsin, March 8, 1848, but his parents, Murdoch and Eliza (McKenzie) Matheson, were natives of the Scottish Highlands, near Loch Elsie. His grandsire, John Matheson, died in "bonnie Scotland," but the grandmother, Jessie McRae Matheson, then joined her son's family in Wisconsin, where she lived to an advanced age. sold it at a price which is about one-tenth of its present value. In the fall of 1869, Mr. Matheson went to South America to work on a sugar plantation of a thousand acres near Georgetown, in British Guiana. The climate was very unhealthy and he returned to Illinois in the following spring. In the fall, he filed claim on a homestead in section nineteen, township twenty-four, range three, in Stanton county, on what is known as the upper Humbug Creek. He lived here for one year, in a small dugout with a neighbor, but later built a slab shanty. In December, 1872, he rented this farm and went back to Illinois, where he worked at farm labor for a time, then farmed on rented land for himself for three years, making his home meanwhile with a very wealthy farmer, whose lack of education enabled Mr. Matheson to assist him very materially in the keeping of accounts, etc. Mr. Matheson's third trip to Nebraska was made in 1878, when he rented the Captain Butler farm near Pilger for some time. In the spring of 1880, he realized the need of a helpmate and returned to Illinois, where he was married at Elmira, Stark county, to Miss Mary M. Oliver, a daughter of Thomas and Jean Oliver, natives of the Scottish Lowlands. 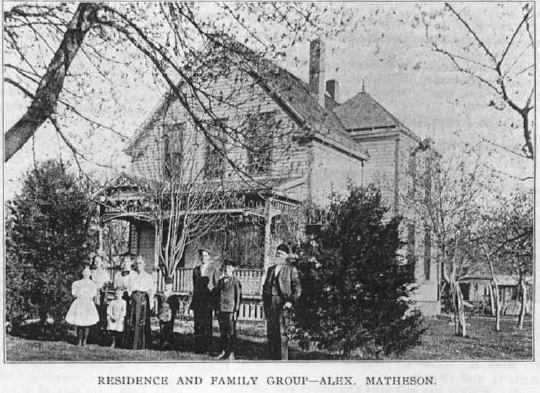 As soon as Mr. Matheson came to Nebraska with his bride, he at once took steps to improve his homestead by erecting a comfortable house, barns and outbuildings, planting orchards and groves, and cultivating the land. he finally developed as fine a farm as call be found in the county. In 1893, he rented the farm, coming to town to live, but in three years was again back on the farm. He sold it, however, in October, 1909, and decided to locate permanently in town, and is now enjoying his ease in a comfortable home in the west part of Stanton. All of the nine children born to Mr. and Mrs. Matheson are living. They have all received a good education, the younger ones being still in school, and all are destined to take a prominent part in social and educational affairs. Jennie, Mary Luella and Barbara graduated from the Wayne normal college and are successful teachers. Earl has taught for some time and is now studying in the state university at Lincoln. Another daughter, Zula Elzora, is also teaching, and the other children, Oliver, Maude, Donald and Lola are attending the schools in Stanton. Originally, Mr. Matheson was a democrat, but he joined the populists in their reform movements and at present is ail independent, voting for the man whom he thinks is best qualified for the office, regardless of party affiliations. Mr. Matheson was away from the state for a considerable length of time after first taking up a claim, and has consequently escaped some of the hardships of the early settler's life, yet he took up his residence here early enough to suffer some of them. He was away during the years of the grasshopper plague, but was living in the state during some of the worst blizzards. He has been a farmer all of his life, and now, having won a competence from the soil, is enjoying the fruits of a life-time of industry and thrift, surrounding himself and family with all the comforts heart could wish. A picture of the family and residence is presented on another page of this volume. Residence and Family Group -- Alex. Matheson. Dr. Kile first saw northeastern Nebraska in the fall of 1883 when he came to the region of Plainview with his father, Ransom Kile, to select tract of land. The father, Ransom Kile, purchased the relinquishment to a quarter section, in Antelope county, four miles west of Plainview, and filed on it under the homestead law, taking possession in the spring of 1884. Here he prospered and resided until 1900, when he bought a residence in Plainview and moved to town. In the fall of 1909, he rented his house and has since made his home with a son in Creighton. Ransom Kile was a native of Knox county, Ohio, moving thence to Lake county, Indiana, not far from Chicago, and in 1879 secured a farm in Cass county, Iowa, where he resided until moving to Nebraska in 1884. He was married in Lake county to Miss Mary Powers, a native of Providence, Rhode Island, her parents moving to Lake county while she was a small child. She died on the home farm in Antelope county, Nebraska, in 1897. Doctor W. T. Kile was born in Lake county, Indiana, August 18, 1857, and lived on a farm there and in Cass county, Iowa, until attaining his majority. He taught school, and read medicine with Doctor Wilder of Atlantic, Iowa, until entering the medical department of the State University at Iowa City, from which he graduated in 1885. On receiving his diploma, he formed a partnership with his old preceptor, and for seven years was engaged in practice at Atlantic and vicinity. In 1889 he removed to Plainview, opened an office here, and was at once recognized as a physician of more than usual skill. He soon built up a large practice and has sustained his excellent reputation as a healer. In the fall of 1909 he discontinued his practice, moved to a farm he had purchased in Knox county, and endeavored to get some respite from his arduous labors in the profession; but the social and educational privileges were not such as his family had been accustomed to, so three months later he returned to Plainview and at once resumed his practice, much to the satisfaction of his old patrons and friends. cox) Halsey, both born in the state of New York, whence they removed to Cass county, Iowa, about 1870. Of the children born to Doctor and Mrs. Kile seven are living, named as follows: Mary, Ruth, Esther, William, Martha, Kenneth and Dwight, Grace and Miriam, the fourth and seventh children have passed away. Doctor Kile is a member of the Methodist Episcopal church, and of the Masonic Order, the Odd Fellows, the Woodmen, the Workmen, and others. In politics he is a republican on national questions, and independent in local contests, voting for whom he considers the best man regardless of political affiliations. Doctor Kile was living in Iowa at the time of the well known blizzard of January 12, 1888; but in that of January 28, 1909, he had several hours' struggle in getting to shelter; so bad was the storm, blinding the horses and at times stopping them, that the doctor and his driver were nearly two hours making the mile and a half to a dwelling, the nearest to them when the storm -broke. No one who has not encountered or witnessed a western blizzard has any conception of what such a storm really is. Doctor Kile is a genial, courteous gentleman, one who wins and holds the confidence of those whom illness throws into his keeping, and this is half the secret of his success. Farmer W. Crew, a pioneer real estate man of Howard county, Nebraska, was born in Belmont county, Ohio, December 28, 1847. He was a son of Acquilla and Rachel (Farmer) Crew, the former born in Belmont county and the latter in Jefferson county, Ohio. In religious views both parents were Quakers. They were married in Ohio and their children were all born in Belmont county where the father owned and operated a farm. This continued to be the family home until 1863 when Acquilla Crew sold and removed with his family to Linn county, Iowa, and there purchased a farm where he and his wife resided until their deaths. Farmer W., was the fifth child in a family of eleven, of whom three brothers and two sisters are still living. He received his education principally in the common and Quaker schools of Ohio and when sixteen years of age accompanied his parents to Linn county, Iowa. On November 20, 1867, Mr. Crew was united in marriage to Carrie E. Force, daughter of Captain Jacob A. Force, at the latter's home in Linn county, Iowa. Mr. and Mrs. Crew continued to reside in Linn county until 1873 when they came to Howard county, Nebraska. The first two years here Mr. Crew followed farming, living near St. Paul. In 1875 he was elected sheriff of Howard county on the republican ticket, and held that office for six years, he being the second man to serve in that capacity in the county. During his service he met with many difficult and trying events. In those days it took more than ordinary nerve and bravery to successfully fill the office, as well as tact and good judgement, in none of which Mr. Crew was lacking. One instance in particular was when in connection with the sheriff of Hall county he accomplished the arrest of the famous outlaw, Doc Middleton, who with a gang of cattle rustlers and thieves had for some time been terrorizing the western states, and after a desperate battle between the outlaw and officers was finally captured and placed under arrest. After his term as sheriff had expired Mr. Crew was in the United States government service, acting as Deputy United States Marshall for three years and also was a revenue officer for two years, during the latter time being stationed in the Black Hills. He returned to St. Paul in 1886, and is now engaged in the real estate business there, being among the pioneers in that line of work. He was a member of the city council of St. Paul during 1889 and 1890, and was mayor of the city in 1891. In the earlier years Mr. Crew was active in establishing the schools in his vicinity, and served on the district board. Mrs. Crew died in St. Paul in 1895, survived by her husband and a daughter, May, who married Chas. A. Robinson, and now resides in Denver, Colo. In 1897 Mr. Crew was married the second time, to Mrs. Clara E. Corliss. They have a beautiful home, and are among the leading members of the social and educational set in their community. Mr. Crew is a gentleman of far more than the usual ability, a foremost member of the business life of his region, and has been responsible in a large degree for the prosperity enjoyed in his locality. He has always taken a leading part in the political life of his county and state.